The Flickr and Blog universe are positively in a frenzy over the discovery of a new line of fabric by Denyse Schmidt available at JoAnn Fabrics of all places. It was first found by Stephanie and posted on Flickr. Since then, photos and fabric have been popping up all across the country. A Flickr group has been created. 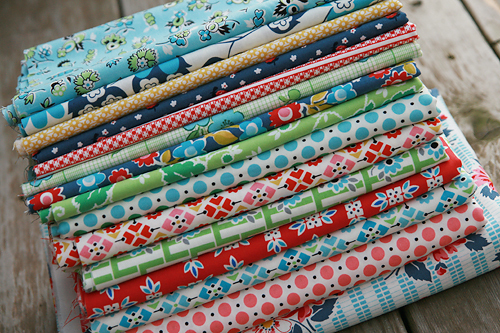 FQ sets and handmade jelly rolls are already selling on Etsy. There is definitely excitement in the air from Denyse fans, as this line looks like a perfect combination of Flea Market Fancy and Katie Jump Rope. With no formal announcement yet from Denyse or JoAnns, the fabric line is being referred to as "Picnic" and "Fairgrounds", which has been found on the receipt of the purchases. There appear to be 21 prints. If you haven't found the fabric yet at your local store, do not despair. It is not in the Chicagoland area either, but there are trucks delivering today so I have my fingers crossed that it is on board. Until then, I can just stare at everyone else's beautiful photos and dream. I also contacted JoAnn Fabric and they told me the fabric will be available on their website mid-May! For readers in Australia, True Up says you can also expect to see the fabric in your Spotlight stores. Update! After trips to a couple stores, I found the prints I wanted! If anyone is in the Chicagoland area, Fox Valley in Aurora has at least 18 of the prints. They were bringing them from the back, so it's possible they have all 21. 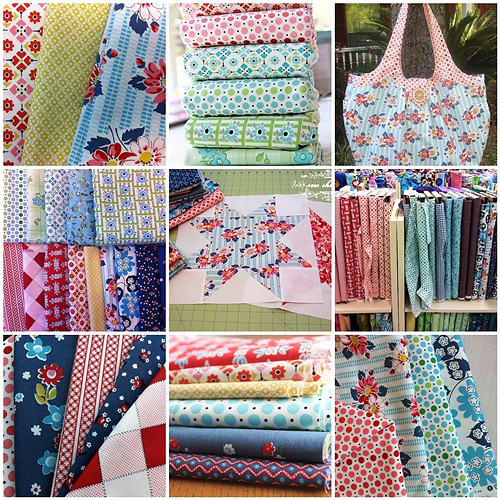 Also, if you shop this week, Denyse's McCall's quilt pattern is on sale for $.99. McCall's pattern number M6341.